Yesterday I saw the movie Rise of the Guardians after much pestering about the glorious animation. And it was glorious, and I did enjoy it very much despite not exactly sharing all of the traditions in the movie, and I was glad to have the opportunity to see it in theaters. A guy revives and is declared "Jack Frost" by the Man in the Moon, and for hundreds of years is invisible to all mortals and causes snow days and general mischief. Elsewhere, Santa Claus, the Tooth Fairy, the Easter Bunny, and the Sandman are guardians of childhood wonder and do things like give kids presents and hide Easter eggs and make good dreams to preserve childhood wonder and protect the children of the world. However this is thrown off by a bad guy, the Boogeyman or "Pitch", who exists to ferment fear in the minds of children, and seeks to destroy the Guardians because he wants to be believed in and feared. 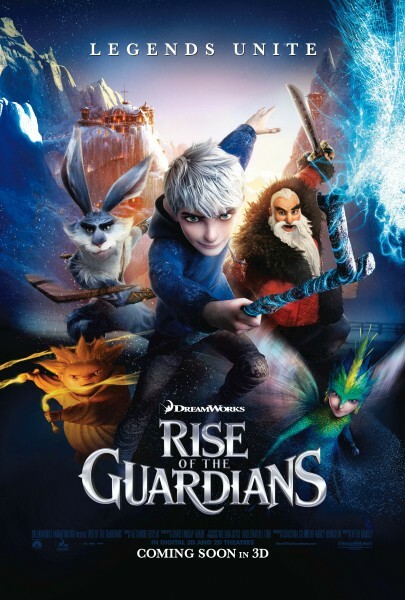 Jack Frost is chosen by the Man in the Moon to be a Guardian and to help the existing Guardians defeat the Boogeyman; however, Jack Frost also wants to be noticed and have a purpose so he sympathizes with the Boogeyman. After much havoc and drama, he sides with the Guardians, eventually becomes believed in by children, the Boogeyman is banished to his underground lair because even though "[kids] believe in him, [they're] just not afraid of him." All is well, and the story ends. It's beautifully animated and a nice story, but by the end I honestly thought there would be some sort of reconciliation with Pitch, about fear being necessary. Because the Guardian's existence is based on belief, the fact that "I believe in you, I'm just not afraid of you" could have been very powerful. Fear needs to exist for bravery to exist. Kids overcoming their fears is a big deal. He might not have been a nice guy and brought candy and presents to kids, but he still could have been important, without need to banish him forever and ever. I guess I shouldn't have expected it, there weren't really any hints of there being any good in Pitch, just that Jack Frost and the audience were sympathetic to his (selfish) need to be noticed. Pitch existed in the dark ages and made things terrible for all children, making them all live in fear until the Guardians existed. So there's really no reason he should be allowed to continue to do anything. He's just a terrible creature, inside and out. Why does Pitch exist? He's compared to Jack Frost throughout the story -- Jack Frost, and the rest of the Guardians, were people before being given this anthropomorphic personification status by the Moon. Pitch Black seems the same as them. Would he not have been human before, as well, and changed into what he was by some outside force? Throughout the story, Jack Frost was constantly reassured by the Guardians that he had some purpose in his "second life," his life as Jack Frost. What about Pitch Black? Was he not resurrected for some purpose? If so, what was it, and why can't he be allowed to fulfill it? We're making a lot of assumptions here, I suppose, the biggest being that Pitch is the same as the other characters in being made the way he is and then was perhaps corrupted, and that he's not something entirely different. However, the way he keeps insisting that he and Jack are the same makes it at least a somewhat reasonable one. This makes Pitch's existence an age old question -- he's the Problem of Evil. The Problem of Evil is often used to "disprove" many mainstream religions -- with the existence of such a strong, benevolent force in the world, why should evil exist? The obvious answer to many is that there is no God and that's that, but the Guardian's universe requires a different answer. There is obviously a benevolent force, The Man in the Moon, who, while not in control of everything in the world, is at least somewhat in control of those he chooses to fulfill certain purposes -- he can choose to revive people into anthropomorphic personifications and choose to elevate their status to Guardian. In the beginning of the story, Jack is upset at the moon for not making his purpose obvious, but becomes a believer by the end because he's found his place. Assuming this is true (another big assumption, that the Moon even cares about anyone's personal development) then the moon doesn't mind "challenging" his subjects. That could potentially be the purpose of Pitch, to test the Guardians, Jack, and the children of the world, but is this really fair? No, I don't mean to the Guardians, or even for the children, the ones being tested -- but is it fair to Pitch? Pitch does not seem complicit in this agreement -- he would have been used. Is it okay to play with people this way, toy with their hopes, make them almost taste victory and then rub their faces in defeat, even if this person has nearly or no redeeming qualities? Let's say, then, that maybe the Man in the Moon wanted the dark ages to be dark for whatever reason, and then created Pitch to fulfill that purpose. The best indicator of future behavior is past behavior. Why is the Moon to be trusted so much when he did something so awful for so many years? What kind of future is in store for the Guardians if the Moon decides to change his mind again, and the Guardians go the way of Pitch for something new? Is it not cruel to throw away a loyal servant such as Pitch, as well? Or, perhaps we can get back to what I had predicted at the beginning, that Pitch is important, chosen in some way for some purpose as the Guardians were, and was somehow "corrupted." Is there no way possible that Pitch could go back to fulfilling that original purpose? Has the moon, therefore, decided that Pitch is irredeemable, and has decided to banish him? Did the Moon make a mistake in creating Pitch in the first place, and is the Moon therefore fallible? Is Jack therefore making a big mistake in putting so much trust in the Moon at the end of the story? None of these are comfortable answers. This is why I generally don't like the idea of a "big good" in most stories, children's stories especially -- the idea of something being able to solve a problem and then not solving the problem for whatever reason is very scary and confusing and often ignored. And, while an adult might be able to figure out the less-than-pleasant possible solutions and come to turns with them, I'm not so sure a child would. I guess it's one thing to see a scary movie, but another thing to confront an existential crisis as a kid. Whenever there is a very powerful force of good and yet still evil, the Problem of Evil leads to interesting questions that I think need to be addressed. But, as I've said before, not all of the traditions in the movie are my own, and this is definitely among them. Jeez. I wish I had seen the movie so I could say something more substantial, but I guess I'll just have to use this (fantastic) post as a basis. I won't deny that the Man in the Moon is less-than-savory, but if I had to guess, he's putting these characters -- and humanity, for that matter -- through their paces. He wants to test everyone and see who comes out on top, be they good or evil, mortal or godlike. Maybe he's just setting up these players and seeing what happens next, either to have them learn a lesson they wouldn't have believed if the Man just told them outright (or not have taken to heart), or opting for a laissez-faire style and letting free will -- and willpower -- be the deciding factor. I can't say whether or not the Man is a cruel being (though by the sound of things, there's plenty of evidence to support the idea), but I'm guessing he's long since passed up ideas of basic morality. Either that, or he's willing to ignore them to fulfill his aims. Well, that's just my theory. Make of it what you will -- but that aside, great post. Certainly got me thinking. I do that writing and reading thing.